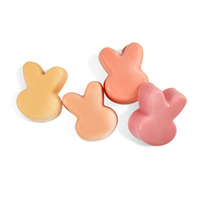 These adorable guest soaps reflect the art of ombre shading. Each bunny is a slightly lighter shade than the previous one. These will look great in any kitchen or bath or would make a great addition to a gift basket. INCI Ingredient Label: Sodium Cocoate, Propylene Glycol , Sodium Stearate, Glycerin, Water, Sorbitol, Butyris Lac (Buttermilk) Powder, Avena Sativa (Oat) Kernel Flour, Honey, Fragrance, Calendula Officinalis (Calendula) Flower Extract, Titanium Dioxide, Benzophenone-4, Triethanolamine, Tetrasodium EDTA, Methylparaben, Propylparaben, Red 33. TE: If you are making these products for sale, good manufacturing practices recommend you wear a hairnet, gloves and a mask. We also recommend a clean apron. Remove soap from the 2 lb. plastic tray. Cut off and weigh 19.5 oz. of Detergent Free Baby Buttermilk MP Soap. Cut soap into small chunks and place in a large glass measuring cup. Weigh .25 oz. of Vanilla Color Stabilizer-MP Soap and .5 oz. White Chocolate Raspberry FO 238 and mix together in beaker. Allow to sit for 2 minutes, but no longer than 15 minutes. Place soap in microwave and heat until soap has completely melted. Remove and stir. Add fragrance mixture to melted soap and mix well. Place silicone mold on large cookie sheet. This will give the mold stability if it needs to be moved. Add 5 drops of Stained Glass Strawberry Red Liquid Color and fill 6 of the mold cavities. Spritz the top of the soap with alcohol to release any air bubbles. Add an additional 5 drops of Stained Glass Strawberry Red Liquid Color to the remaining soap and fill an additional 6 cavities. Spritz the soap again. Add an additional 4 drops of Stained Glass Strawberry Red Liquid color to the remaining soap and fill an additional 6 cavities. Spritz, again, with alcohol. Add an additional 3 drops of Stained Glass Strawberry Red Liquid color to the remaining soap and fill and additional 6 cavities. Spritz, again, with alcohol. Allow soaps to completely set up before unmolding. 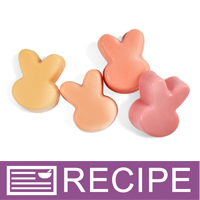 We packaged 4 bunnies, one of each shade, to create an ombre effect. Four will fit into each poly bag, and then can be tied with raffia.